Live events are growing in popularity as our world evolves from sending emails to answering the age old question: "what are you doing?" For those of you who have been living under a rock, social networking sites have status updates that allow you to answer the simple question of your whereabouts or what you are doing. Some people give us way too much information to EXACTLY what they are doing which is also known as TMI (too much info). An example of this would be anything involving activities in the bathroom, bedroom, or anything else just oh-too-personal for the world wide web. Remember: the world wide wide is not private. If you don't want you future/current employer, parents, or in-laws to read your inner-most thoughts, don't post it! There are also ways to select which users can see your status updates on Facebook: go to settings ,privacy settings, profile, status and links I think there is a customize but start typing all the friends you don't want them to see. Live events are also becoming the 'it' way to not only get up-to-date news coverage but to experience news. I participated in a town hall meeting hosted by President Obama last week via Facebook Live. The video coverage plays while Facebook users type their comments similar to a chat room. However, all comments that are typed are automatically updated to your current status. This could be a nuisance or entertaining to read back this one-sided conversation (it also makes your friends scratch their heads if they have no idea what's going on). Also, during live events, sometimes questions and/or comments will be pulled from Facbook, Twitter, or MySpace and displayed at the event. This makes it possible to get involved with politics and have the common voice be heard! If you would like to participate in the next live event check out CNN's website. 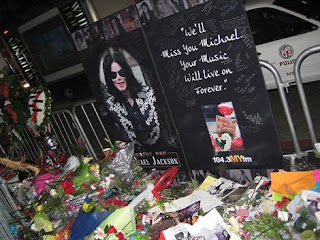 Today, July 7, at 12pm Eastern, there will be a LIVE event for Michael Jackson's memorial. Share your thoughts, prayers, and memories for the "King of Pop".